For all brass instruments. Composed by Bai Lin. Instructional Method. Full score (study). With Standard notation. 40 pages. Carl Fischer #BQ00038. Published by Carl Fischer (CF.BQ38). This is one of Balquhidder's most popular titles. The Professor of Trumpet at the Central Conservatory in Beijing, China has composed an extraordinarily well organized 40-pagebook of flexibility studies which spans the elementary to advanced levels. A new standard text for brass embouchure flexibility whichdeservedly joins the pantheon of other such studies by Schlossberg, Irons, Colin, Smith, etc. book of flexibility studies which spans the elementary to advanced levels. 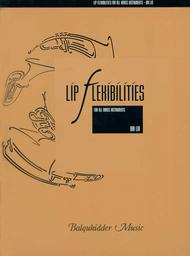 A new standard text for brass embouchure flexibility which deservedly joins the pantheon of other such studies by Schlossberg, Irons, Colin, Smith, etc. Excellent method, quickly got flexibility and agility, and the delivery service was excellent, I received my shipment quickly and in good condition.